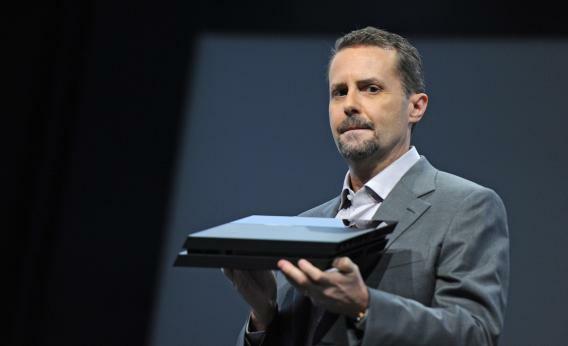 Sony CEO Andrew House unveils the new PlayStation 4. A new official PlayStation 4 “instructional video” represents Sony’s first volley in what is bound to be a bitter console war. The video, in which one gamer simply hands a disk to another to illustrate how to share PlayStation 4 games, mocks the Xbox One, which imposes several restrictions on sharing, trading, and selling games. Such restrictions, known as digital rights management, are meant to prevent people from copying games illegally or, depending on your view, force players to cough up more money. As DRM has become more popular, it has also become more controversial, and highly anticipated titles such as Diablo 3 and Sim City 5 have endured tremendous criticism for their DRM restrictions. Sony seems to be capitalizing on the anti-DRM sentiment to promote its PlayStation 4, which was unveiled Monday at the Entertainment Expo (E3) in Los Angeles and will retail for $399.